Can you climb the word ladder? At each step a new word must be formed by changing one and only one letter, and without rearranging the order of the letters. 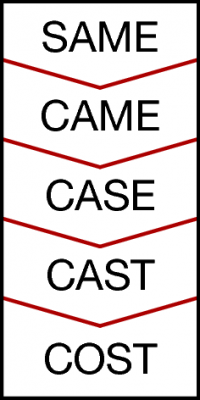 In harder puzzles longer ladders with longer words are used, and careful choice of starting and ending word makes it clear that these puzzles are handmade, as in several of the samples here which offer "TIME LEFT", "MAYOR FIRED", "NICE ARMS" and so on. These need not be drawn vertically but can also run horizontally which can help them fit on the page.